So it’s a few weeks back and I’m doing my thing, working and trying to balance the fact that taxes MUST get done and work MUST get done and trying to not stress out beyond this nasty migraine I’ve given myself and it’s not quite working. And while I’m thick in the middle of it I hear my sweet little puppy Carly barking clear on the other side of the house. And she sounds alarmed. Panicky even. I whip out of that chair and go flying into across the house and I start to notice that there are pieces of cat poo here and there. Like freaking breadcrumbs I follow the nasty to the master closet where, we currently have a litter box for JouJou who has he’s decided he’s peeing in there regardless of whether or not there is an actual place for him to go. And Carly is there, in the middle of this box that I have no clue how she got into, by the by. And she’s throwing litter around like freaking confetti. And while I scream and freak out she is SO HAPPY TO SEE ME! And she barks and carries on, because that’s what we do! And because she’s stuck. EW! Just ew. I swear I don’t know if I’ve ever seen a happier dog in my whole life :) And I guess that sort of leads me to where we are now… me making wall art sort of inspired by my dog raiding the litter box. You just can’t make this stuff up, people. Now I could pretend like I totally took this very famous internet saying and modified it to fit myself and my circumstances but that would be a lie. I got confused. And after I showed Rob my art and he admired how me it was and how much he loved it (which means so much to me since he is like a super accomplished, crazy talented artist) I explained that the saying was popular and we somehow got to how that saying was not anything… the actual saying goes “throw KINDNESS around like confetti.” Flippity flippin’ dang. This whole thing came together kind of interestingly enough. Rob needed to go to Hobby Lobby and I didn’t need a dang thing which is weird because 9 times out of 10 I always need something crafty. While he went to the art section I told him I’d meander. I could kind of hear the disappointment because he thought this was going to be in and out. Sorry buddy. I’m gonna browse. I happened upon a great clearance sale. Normally I totally poo-poo Hobby Lobby clearance because it’s so often more expensive than you would have gotten it if you waited around for a half off sale in that category at full price. I mean, what’s the point in buying phasing out stuff if I can get something that is newer and will be in stock if I find I need more of it for CHEAPER? It makes no sense to me. I’ve also gotten some bum stuff on clearance. There was the screen printing kit where all the paint had dried up and I was given a “well it WAS on clearance.” and a refusal to take it back. Granted the policy is no returns on clearance but I thought that if it was something that had gone bad they’d at least swap it out for you. Nope. 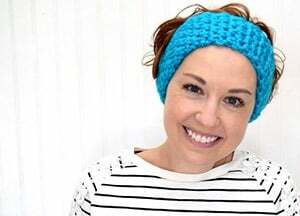 So in my experience Hobby Lobby clearance stinks. But I found a big rug and a new pillow for my office chair and this framed picture all for a really good price. And none were jacked up, either! Woot! 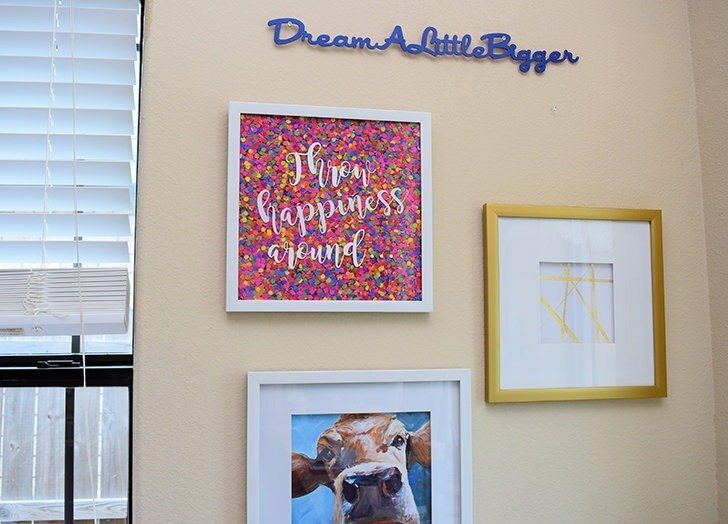 Now this wall piece was about to get one heck of a makeover. In fact, I didn’t care enough about the art inside of the frame to determine if I did or didn’t like it. But that didn’t matter because it wasn’t the picture I wanted, just the frame and this was MUCH cheaper than the frame I had found and liked just as well. 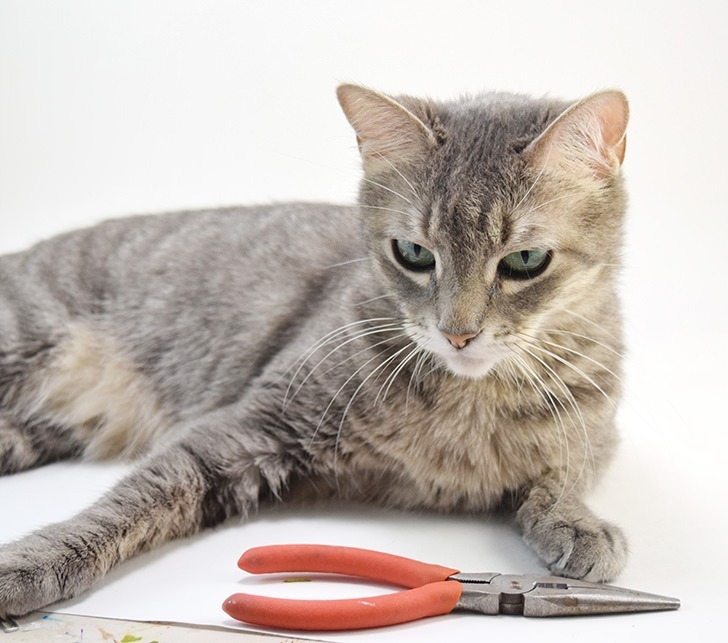 Now if you’re lucky to get a frame for a reasonable cost good for you! 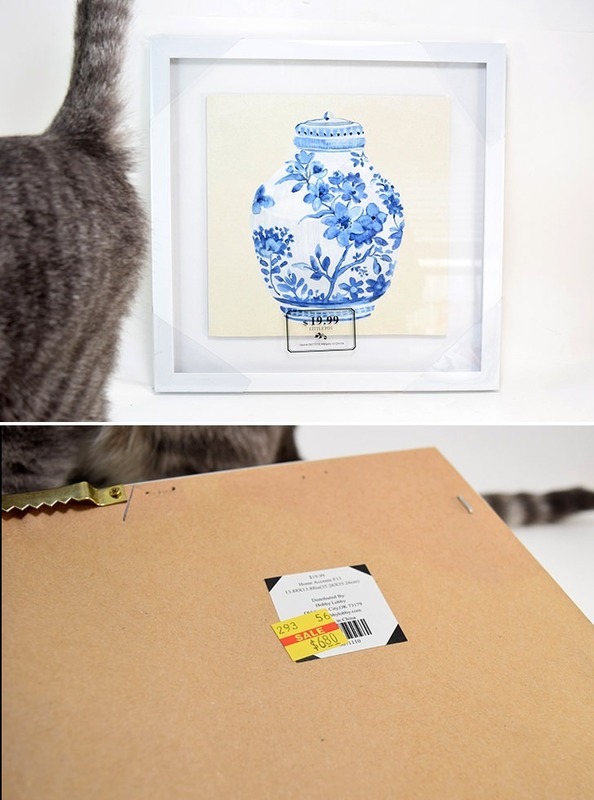 If you are going to re-purpose something else keep on with me because I’ll show you how to take apart a framed picture. 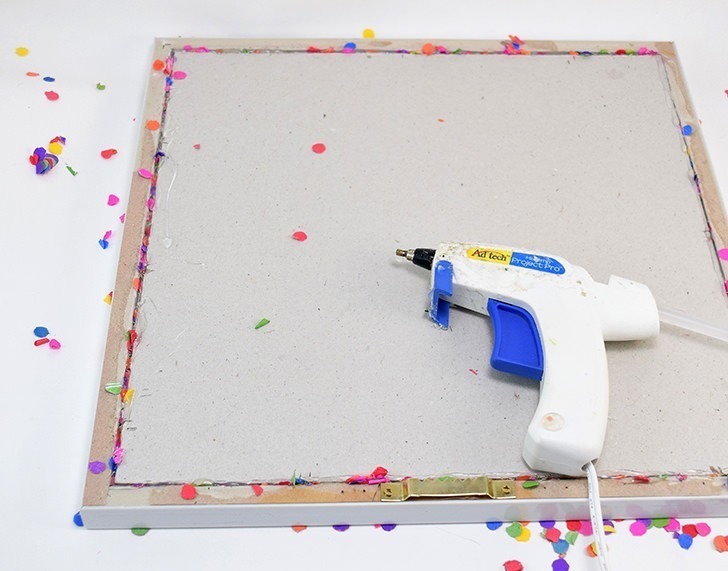 First you’ll need to peel the paper off of the back of the frame and remove those little pins that are keeping the image inside. 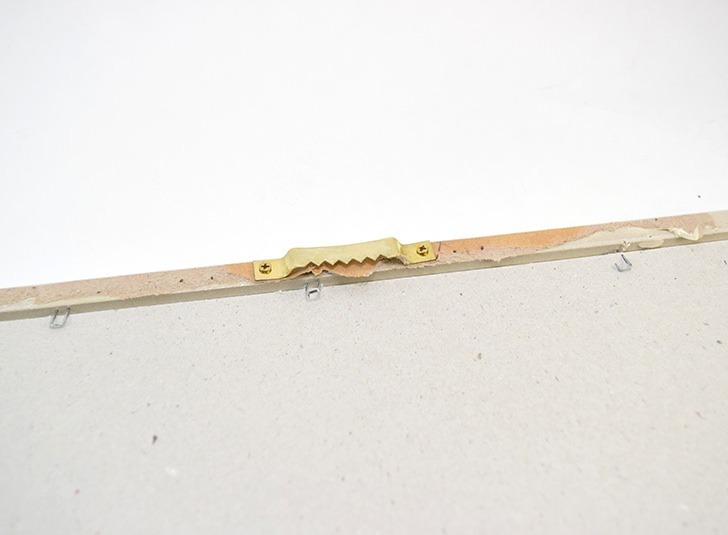 Be sure to leave the wall hanger(s) alone so that is one less thing you have to DIY up! Once you get the frame apart take the board inside out and survey what you’ve got. You might wind up having to peel a raised piece away (as I did) or you might just have to take a picture out from behind a mat. If the image is glued onto the board inside and no worries. 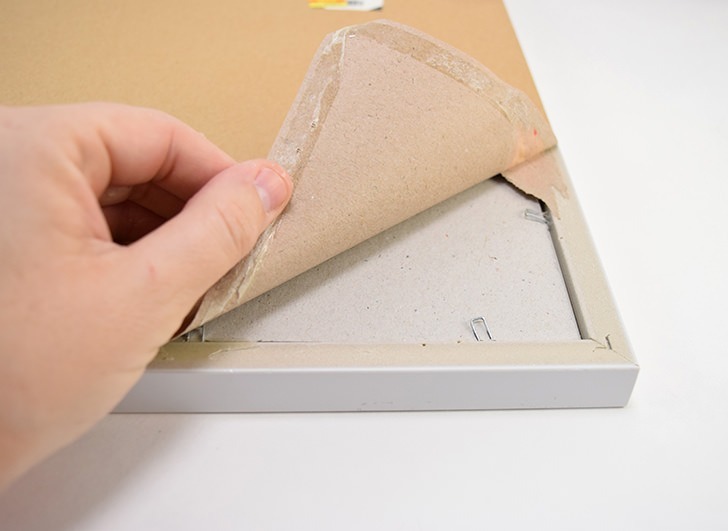 Simply take a piece of heavy cardstock and glue it on top to mask it. 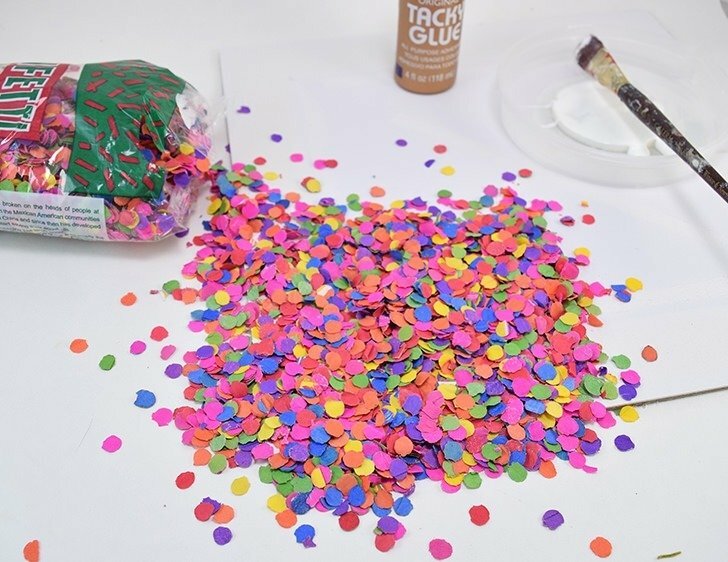 Apply a heavy amount of Tacky Glue in one area and then heavily apply paper confetti. 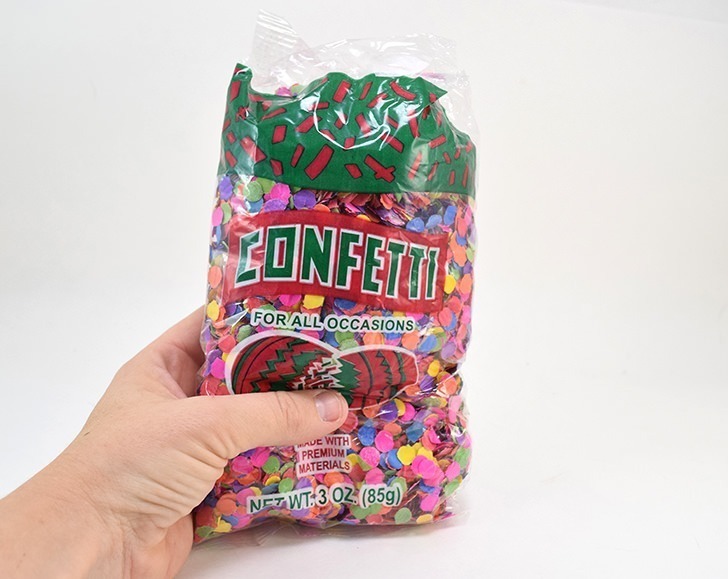 Don’t shake the confetti away, simply allow the glue to dry and catch as much of the confetti as possible. Continue for the full piece and allow a few hours of dry time. Remember to clean out your brush! 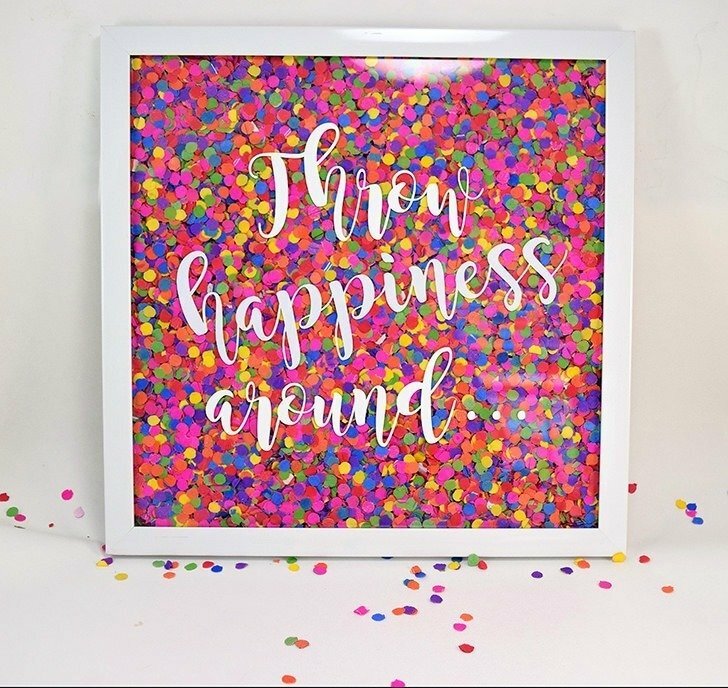 Make sure the inside of your frame’s glass is nice and clean and then sprinkle with your left over confetti. 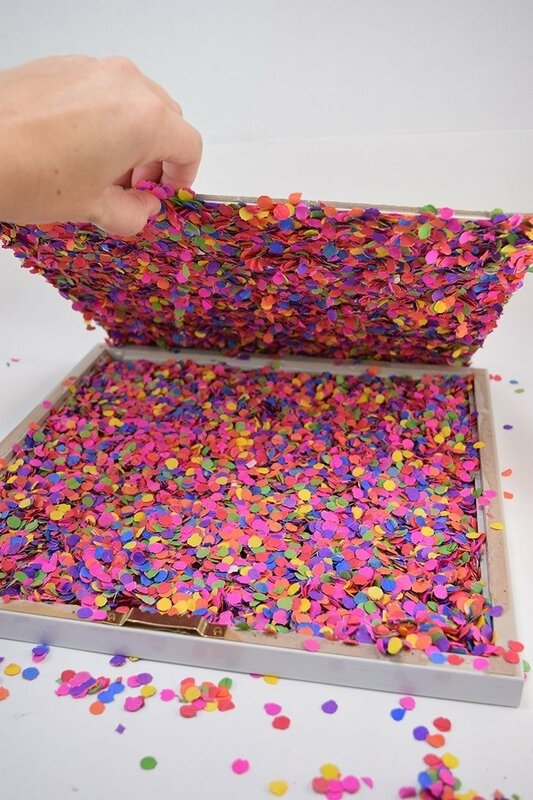 Place your confetti covered backing in and then carefully tip the piece up. 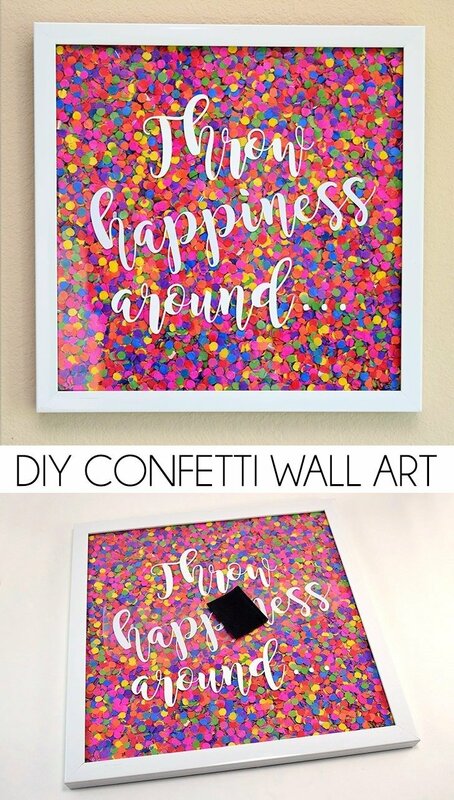 Shift the confetti around inside to fill any obvious gaps. 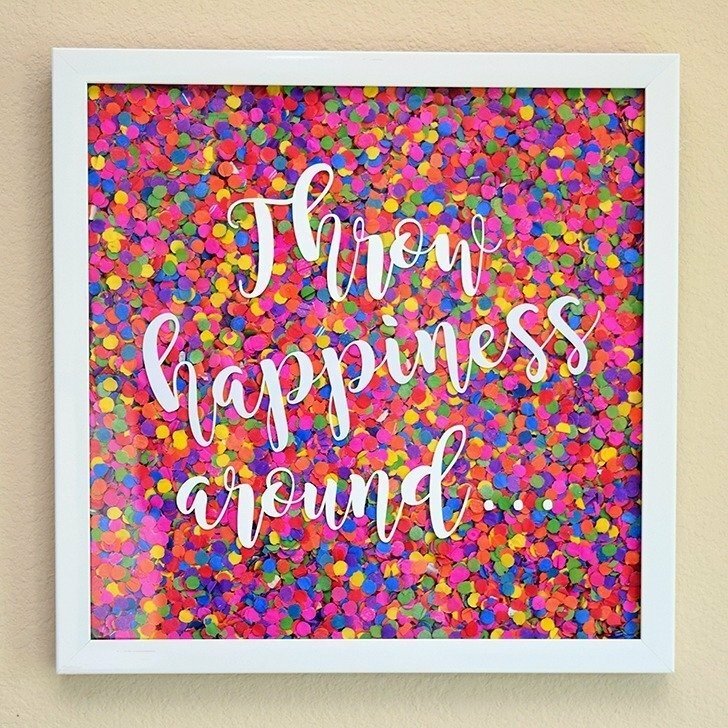 Be sure to hold the frame vertically (carefully so as not to confetti up your workspace!) and make sure you’re happy with the fill. 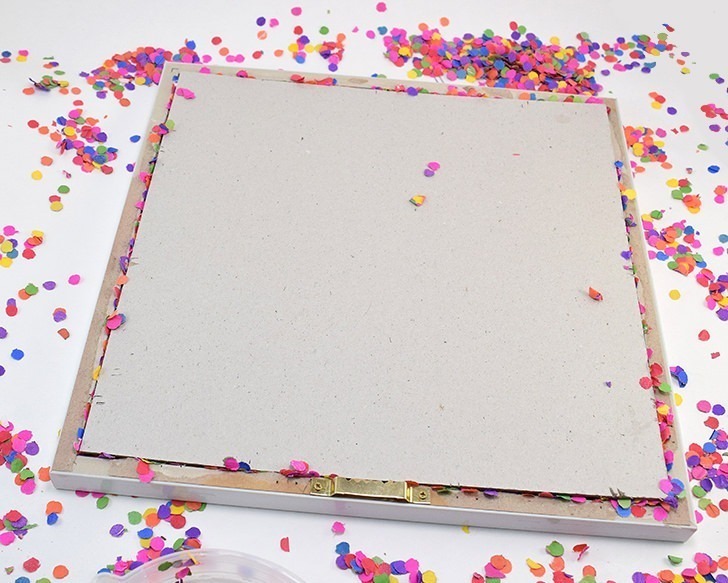 Try to remove as much loose confetti from the back of your frame and use hot glue to seal the frame shut. Boom! 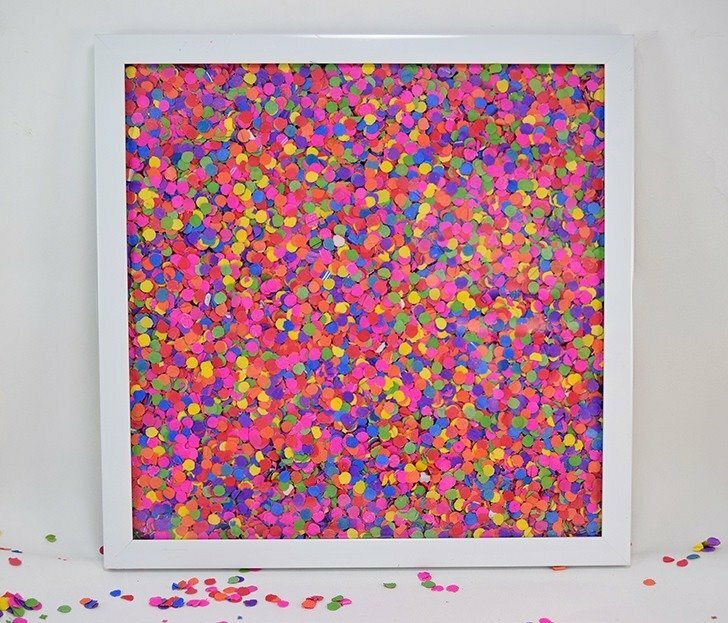 Confetti art! Now I could, quite honestly, be happy with this as art and call it a day BUT I had a saying to get wrong and tack on this baby so let’s keep on a goin’! 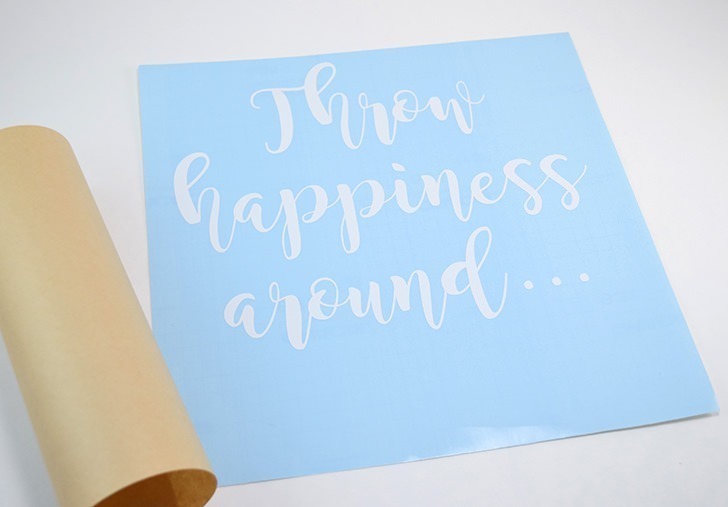 Using you free Silhouette cut file ~or~ FREE Magnolia Sky Font cut your words out of matte white vinyl. 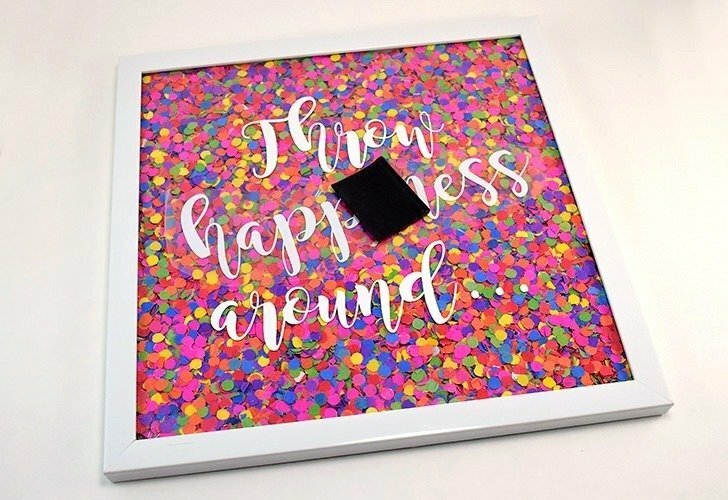 Use transfer tape to cleanly move the words from your vinyl backing to the glass front of your art. The next go I decided to tilt the word happiness just a little bit to fill the space a bit better and I keep waffling about if I like it better this way or if it would be better straight. Either way this is how I have it now so I’m gonna be okay with it! Yay! Now look at that! How fun is that? I LOVE it so much and it adds the perfect amount of color to my gallery wall I’ve got going. 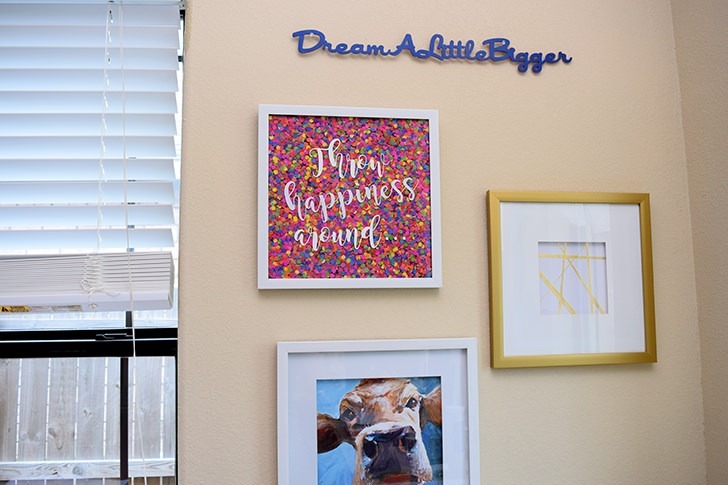 We’ve got the Dream a Little Bigger metal plaque I got from iLoveToCreate for Christmas last year (and painted hot pink and blue!) and two pieces I got from Hobby Lobby. I especially love that cow but I bought the piece on the right more for the frame and mat than anything. Hmmm. Maybe I can DIY up something for it, soon!